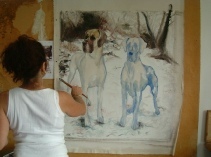 Contemporary art & portrait paintings by Sandy Lipman BA (Hons) a Welsh artist specializing in portraiture, male art, oil paintings, watercolour paintings, mixed media paintings, corporate art, modern art, representational & abstract artworks, murals, portraits from photographs or sittings, portraits of dogs, cats, horses, animals & people. Based in Cardiff, South Wales. I am currently working on a range of sports paintings featuring famous rugby players. Available to Art Societies/Groups for encouraging critiques, practical demonstrations & workshops. Commissions welcome. Greetings cards & prints available.